In this article, I will guide you the steps and the documents needed for crossing into Laos via Thai-Laos Friendship bridge 1 at Nong Khai. However, this would be also generally applicable for all Laos Border crossing overland by motorcycle and I’ll share based on my personal experience from my 6 Nation’s Borders Ride. Important Note 1: It seems, from March 2017, they seem to have dusted off the old rule book & no foreign motorcycle less than 250cc can cross into Laos. 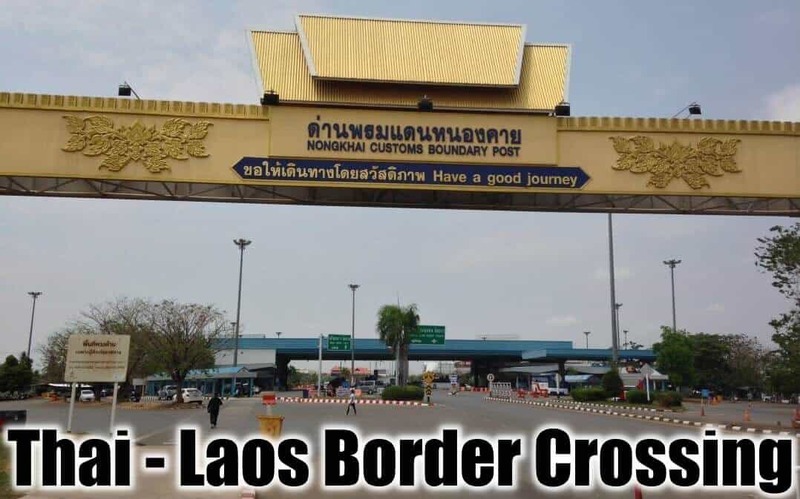 Based on feedback from others, this rule only applies to all (4) Thai-Lao Friendship bridges border crossing and you may have luck at the smaller border but I just can’t confirm! Laos border crossing rules changes from time to time and no one knows about it until someone has been denied entry. Important Note 2: No rental, Friend’s etc Motorcycle / Car is allowed. It has to be registered on your own name. Alternatively, you can also get cheap thrifty car rental in Laos. If you’re coming from Malaysia, you can also refer to Malaysia – Thailand Border Crossing. 1. International Driving Permit (IDP). 2. 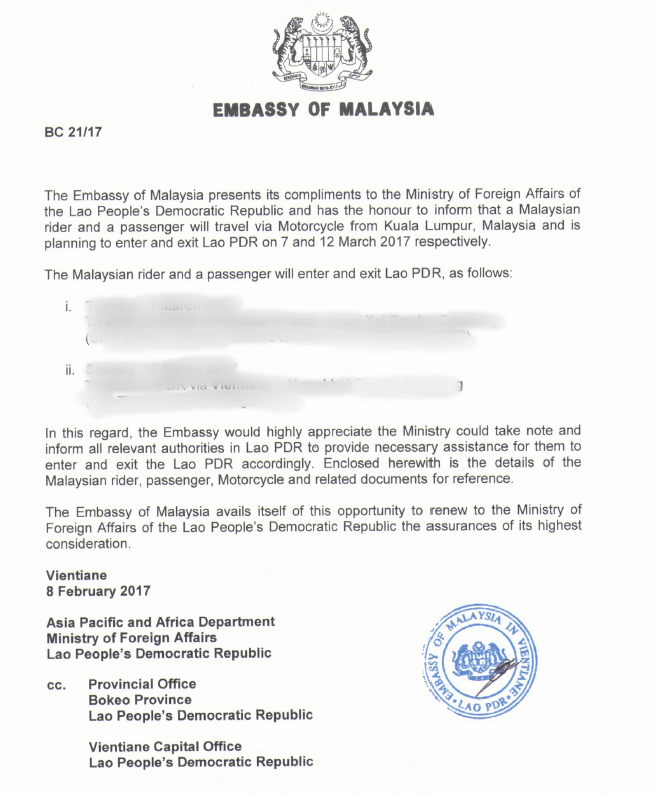 Compulsory – Supporting letter from Laos Embassy in your country (i.e. Malaysia). 3. Optional – Supporting letter from your country (i.e. Malaysia) Embassy in Laos. 5. Temporary Imported Passenger Vehicle form. 6. Original Vehicle registration card (Grant / VOC). 7. Passport valid for 6 months at-least. 9. Visa – (Not needed for countries that have been exempted). 10. Immigration forms (Arrival Card). Note: If you’re not Malaysian, you can contact your country embassy in Laos and Laos embassy in your country to get the supporting letters. Address: No. 7, Jalan Mesra, Off Jalan Damai, 55000 Kuala Lumpur. a. You need to attach one copy of your Passport and Vehicle registration card (Grant / VOC). b. You will need to pay RM 100.00 which they will provide you with an official receipt and you will get their supporting letter within 3 working days. 2. 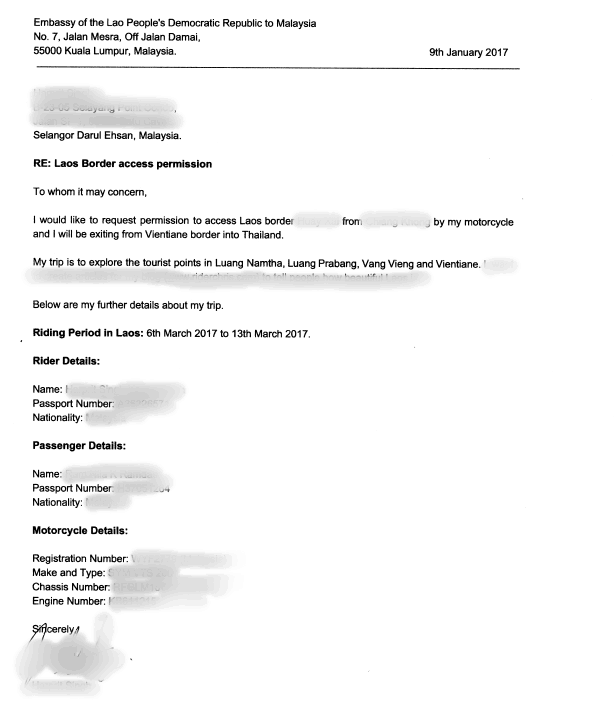 Email Malaysia Embassy in Vientiane, Laos ([email protected]) along with your scanned passport, Vehicle registration card (Grant / VOC) and supporting Letter from Laos Embassy in Kuala Lumpur. Stamp your Passport at the immigration counter. Return your Thai TM2 (with TM3 if you have passenger) form(s) to the Immigration officer. Fill up your Laos Arrival card (White Colour) and you can get it at the border. Now, head to the Custom’s counter and they will give you vehicle inspection form as per below which you will need to take it and head to Room # A15 (Big Building on the left) and show your supporting letters from both embassies to the Head of Border Custom, he will then signed on your form after checking on your papers. Next, take your signed vehicle inspection form to Custom Counter and you need to pay KIP 25,000 (RM 12 or Thai Baht 100). They will fill up your vehicle’s information into their system and give you a printed copy of Customs Declaration for Temporary Imported Passenger Vehicle (Green Colour). Do not lose this as you will need to return it when you exit Laos. Stamp your passport at Immigration. Return temporary import permit for your vehicle (Green Colour) to the custom officer. Do I really need the letter from Embassy? Well, it depends! 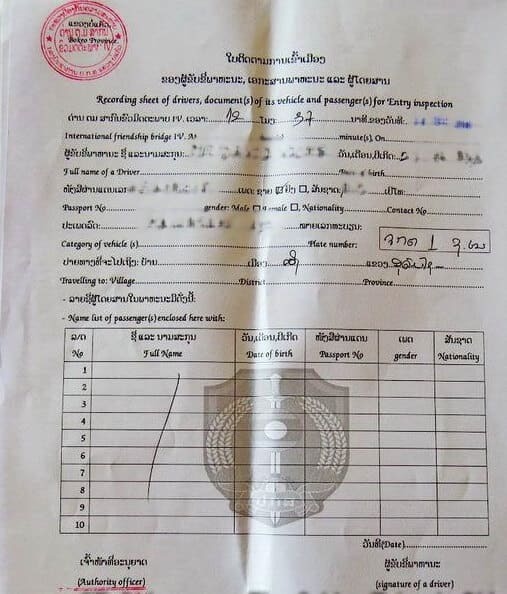 I’ve seen those using Thailand registered vehicle crossing into Laos without the need of providing such document(s) from embassy. This is because Thailand has land transport agreement with Laos as they’re neighboring country. 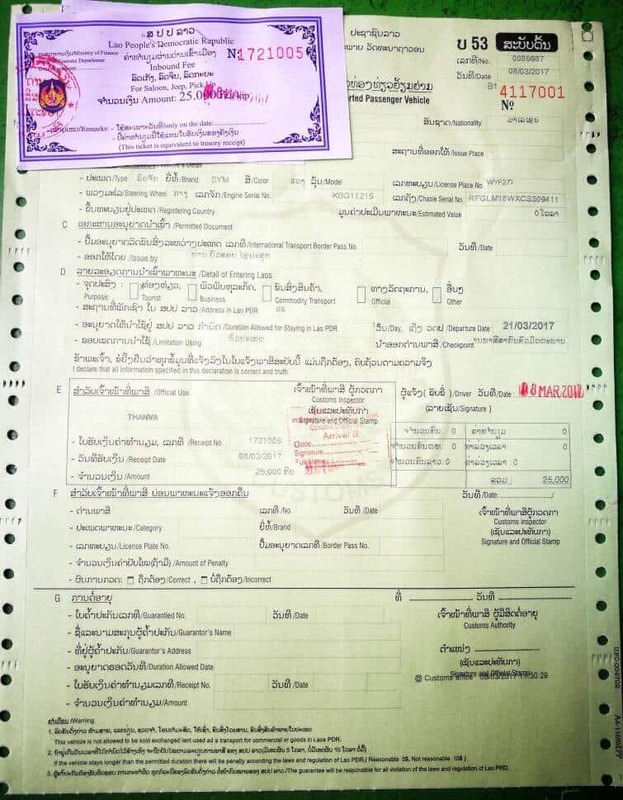 If your vehicle is not Thai registered, you must get supporting documents from the embassies in advance to avoid any hassle at the border as this was required when I crossed into Laos by my motorcycle. How long can I ride in Laos? The period that you can keep your vehicle in Laos varies. Nongkhai/Vientiane border’s custom normally gives 7 days but you can ask for a longer period. 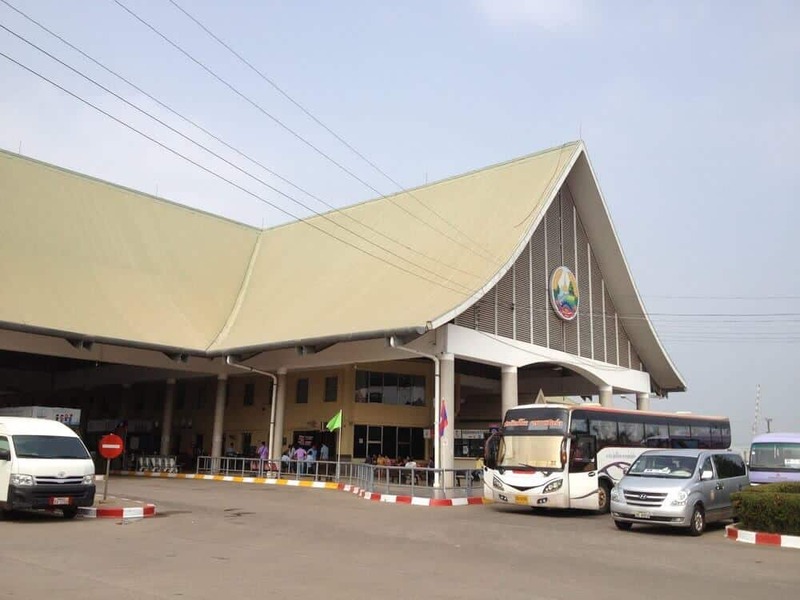 Other border crossing often give 30 days – best is to ask for 30 days on the Lao side. Do I need International Driving Permit (IDP) / License? Yes! Most important for riders to know is that Lao insurance provider does not cover claims if the rider use a national (non-Lao) driving license. I do own an IDP and this makes me much more confident riding in Laos and if you’re Malaysian, you can get it at JPJ’s office for RM 150. Do I need Laos third party insurance for my vehicle? Yes, you can go to jail without it! Please note, the third party Lao insurance only covers bodily injury for a small amount and not for the repair works on vehicle(s). You can buy Vehicle Insurance at the border complex itself, 50m on the right after the immigration counter at 20,000 KIP for 7 days coverage. Just ask around if you can’t find it. I’ve spent alot of time asking insurance companies and all them does not or have stopped providing coverage for damage to the vehicle itself, or for damage to other vehicle in an accident whilst you’re in foreign country. Having a travel insurance is really important and some even choose not to have one but honestly, accidents do happen and they also seem to happen when you least expect it & least need it. Medical bills can cost a fortunate abroad and with good travel insurance, you can have a peace of mind. so please, if you don’t do it for yourself, do it for your loved ones.